Place chicken and water in a large stock pot. Bring to a boil, remove scum and reduce heat to simmer. Add remaining ingredients and simmer for about 1-1/2 hours. Remove chicken and spices for a clear soup. Add consommé powder and stir. Chicken can be shredded and returned to soup if desired or used for chicken salad and other dishes. Prepare matza balls. Add to soup. Mix eggs well with a fork. Add the oil to combine. Add the matza meal and salt and pepper and mix well. Mix in the seltzer. Cover and refrigerate for several hours. Bring water and salt to a boil in a large pot. Dip your hands in cold water and gently make about 10 balls slightly smaller than ping-pong balls. 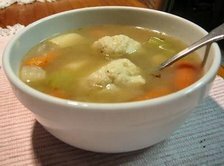 Place the matza balls in the water. Cover and simmer about 30 or until soft.